Duplicate files kill your PC memory. These files not only use the disk space but also clutter up your drive and makes your PC slow. You need a powerful tool to find and delete duplicate files. Here I will show the tips & tricks to remove duplicate files easily. Duplicate files can be created on your computer for many reasons. Most of the files are legitimate and useful for your PC performance. Majority of files will be in the form of JPEG, PNG, Videos & GIF which are downloaded by you over the internet. You need to think twice before deleting any duplicate file because sometimes removing these files may harm your PC performance. Do not delete files from system folders like Windows and Program Files folders. This tool is easy to use and packed with many different options which makes things easier. It is different from other tools which offer simple interface which helps you to find duplicate files. In addition to this, it has built-in preview page which allows you to preview videos & images and listen to the music. Unlike other Duplicate file finding tools. With this tool, you can choose the files what exactly you want to delete. This tool is compatible with Windows XP, Vista, Windows 7, Windows 8.1 and Windows 10. 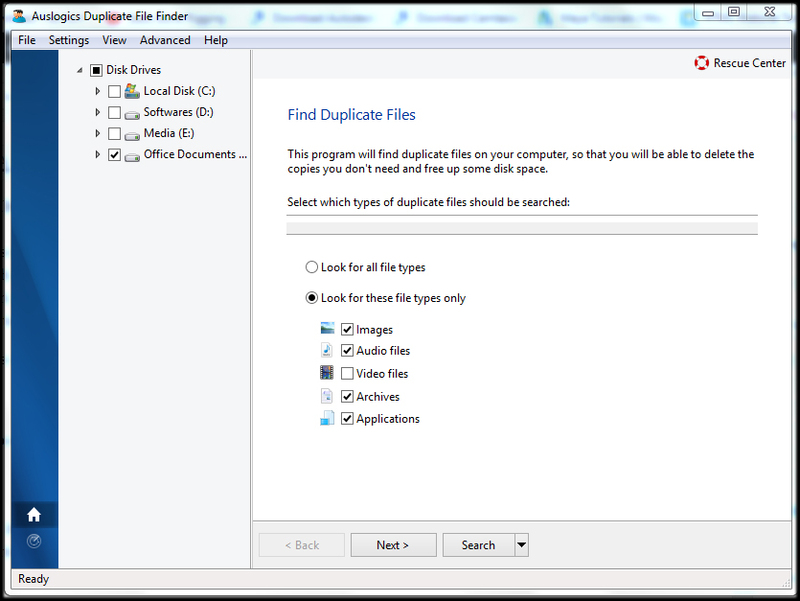 Download & install the Auslogics duplicate file finder from here. Auslogics giving this tool for free so that you can get full features of it. Skip all the additional software which get recommended in installing process (Important). After installing the software launch the tool and select the drive, Folders which you want to search from the right pane. Also, select the file type you want to look for and then click Next. Choose the folder you want to delete. Choose the option which you want to ignore. For example, if you don’t want to search for a game file which is above 3GB in size, you can choose the second option. So that tool will ignore the files which above 3GB in size. If you don’t want to choose either any one or both options, then you can proceed to next step. Choose the file type you want to delete. In this step, if you’re looking for a particular file to search, then you can enter its name. It will help you to narrow down the search results and speed up the process. Search the duplicate files according to files names. Here, choose the method of file removal process. If you want to move the files to Recycle Bin, then select the First option ‘To Recycle Bin’. If you want to recover the deleted files later, then choose the second option ‘To Rescue Center’. Choose the third option if you want to delete the files permanently. Remember that you cannot recover the file later. select how you want to delete duplicate files. Then click the search button. The tool will start the search process and shows you the result with duplicate files. You can choose the files which you want to delete. Select & Delete duplicate files. 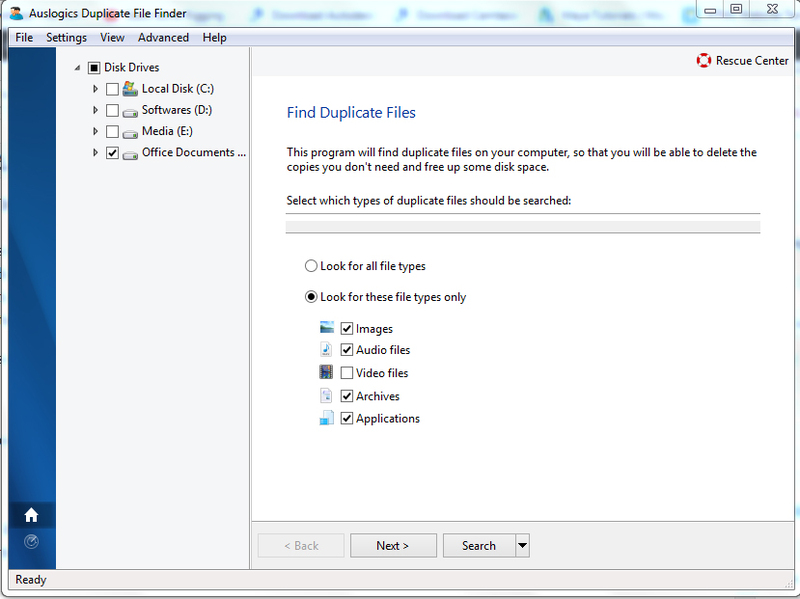 That’s it, Auslogics duplicate file finder makes the work simple and easy. You can delete duplicate files in just five steps with Auslogics. CCleaner is another excellent tool which helps you to clean all duplicate files on your PC. CCleaner is the tool which already installed in most of the PCs. If not you can download and install it from here. It helps to optimise your PC by finding and deleting a lot of Junk files. Moreover, it deletes unnecessary files on your bootable disk and uninstalls unwanted software in just one click. It also helps to remove the data from Temporary files & Old Prefetch data very quickly. 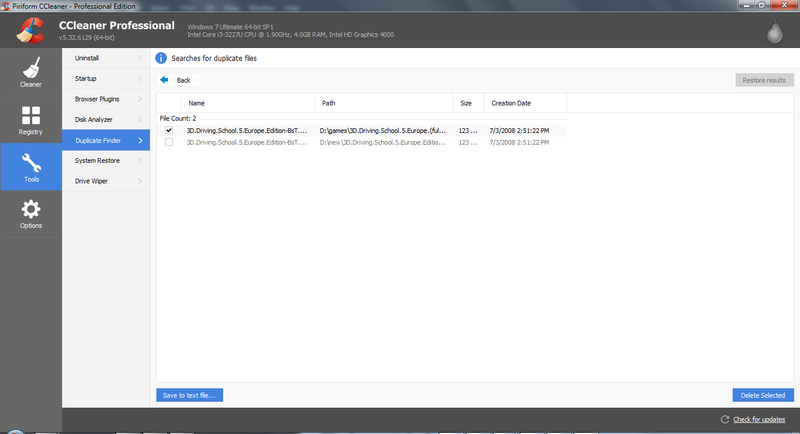 With CCleaner, You can find duplicate files according to Name, Size, Modified Date & Content. This tool has default settings which are sensible and allows you to search for any while on the selected Drive or folder. Unlike Auslogics duplicate file finder, CCleaner includes all the folders in chosen drive including Windows, Program file on Local Disk. To find and delete duplicate files, launch CCleaner and click on Tools in the left pane. Now you’ll get a list of files where you can select them and delete from your drives. You can also save a list of files into a text file. Select and delete duplicate files. That’s it, with CCleaner you can delete all unwanted duplicate files and enjoy more space on your PC. SearchMyFiles is an advanced tool that comes with more customizable filters. It is portable, and you don’t need to install this tool. You can exclude the folders, files and search according to Created, Modified and accessed date & time. This tool comes pretty handily, easy to launch and you can find the duplicate files quickly. This application can download from here. After downloading the ZIP file just extract it to the location. You can launch this tool any time by clicking on the icon with Folder and Magnifier. Just with simple adjustments according to your requirement click Start Search. select drives and files you want to delete and Click Next. Now you’ll get duplicate files in another window. Just select the files manually which you want to delete and click Shift+Delete buttons. In another way you can go to Files -> Delete selected Files. You can also move files to recycle bin, Save Files information, Rename, copy files. This tool comes with a user-friendly interface which is simple and easy to use. The main feature of this application is it allows the user to preview the files before deleting them. By default, it will not include system files and folder before scanning. You can adjust the settings before proceeding for the scan. On the other hand, this tool can search the files by similarity. Therefore you can identify similar files with a percentage you choose. Download the tool from here. You can get the detailed tutorial for this Application from here. As shown above, you can use any of the tools to find and delete duplicate files on your PC. I use Auslogics as it comes with advanced features that help to delete exact duplicate files. I suggest that you can use duplicate files deleter because it will do a thorough search of your hard disk and find out the two or more duplicate files of the same file which may be stored at different locations and this give you a complete list of all your files and you can decide what you want to do with them. This program also give you a detailed analysis of how much space can be saved if you remove the files and it helps you to find their exact locations. Hi Jaydeb Nilson, I appreciate your suggestion. Yes, duplicate files deleter is also one of the best duplicate file removing software.